"90 minute diet?" you ask. Well, it's a term I decided to coin one morning last week and it's got two simple rules. 1) Eat less. 2) Pace food breaks at least 90 minutes apart. For example, right now I am eating my lunch, and in 90 minutes I'm going to go take a stroll around the grocery store and pick myself up a pint of something frozen and tasty some new jell-o. When I was at Walmart two weeks ago and saw some new puddings, I thought "oh boy, new flavors!". At some point after calming down, I started thinking "ummm, why are they coming up with new flavors now? ", especially after theimpulsivebuy posted a shot of all six new flavors. Well a little more shopping on Monday made me realize that the new puddings are here so that you (the parent) can shove them in your kid's lunchbox. It's all so clear to me now. So here is the Jell-o Strawberry Shortcake. I take a scoop from the "plain white" pudding but it ain't so plain. It's already got a bit of strawberry frosting type flavoring in it. I should have tried a bit of the topping to, but I was in a rush to see just how red the pudding would get when mixed with the bits. Well it's not red, but it's definitely pink. I try a bite and it bites back. I try some more and think it's not so bad. It's a small container so I take small bites until I get about 70% done. That's about when I've decided I've had enough of this overly sweet treat. I like strawberry flavored things but this one is just yuck. It may not be a super artificial taste, but it's definitely unsettling. Maybe if you spread this on some angel food cake it might be kind of neat, but otherwise I would avoid this one. 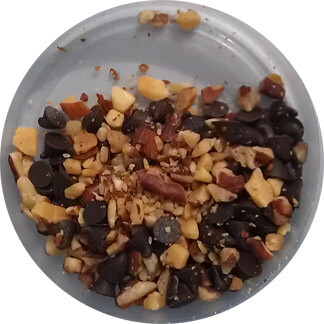 and a neat little mix of almonds, pecans, and mini chocolate chips. Jell-o Oreo Dirt Cup. I expect chocolate with some Oreo crunch and some purty rainbow snowflakes to boot. What could go wrong? Well, those cute colorful little stars could be way to crunchy. There seem to be a multitude of them in every bite and it's really ruining what should have been an awesome chocolate cookies 'n cream vibe. I would have preferred soft flowers that were seen and not heard. Oh well, guess we're going 0-3 on these new puddings. The flavors I haven't shown are birthday cake, german chocolate cake, and banana caramel pie. Ok, technically the next two things aren't pudding, but they serve the same purpose. On Second Scoop: On a very sad note, I yet again let 2 of the 4 go past the expiration date. I know, I'm slackin, but it's not a total loss. 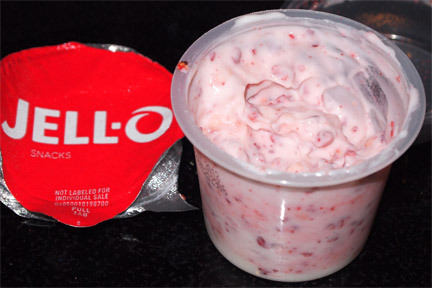 I swiped the crunchies from the tossed parfaits and threw them in my raspberry yoplait yogurt. It was surprisingly good in an almost raspberry cheesecake kind of way. Not sure how that happens but obviously there's a bit of flavor magic going on here. 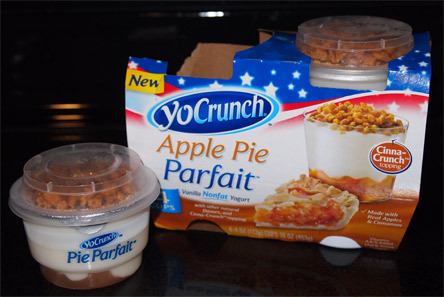 It's a shame you can't just buy a box of crunchies and add them to whatever flavor of yogurt you prefer. 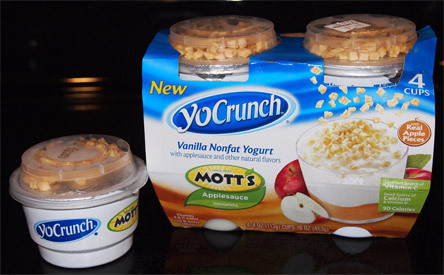 New for 2012 it's the Motts Applesauce version of Yocrunch. I decided to have one as a dinner appetizer and it wasn't bad. The yogurt had a bit of a bite to it and then that was actually emphasized when I mixed in the applesauce. I can't say I'm a huge fan of the dried apple bits. Sometimes they are crunchy, but sometimes that are kind of cardboard like. Overall these don't do a whole lot for me, though I'm pretty sure I cant pawn them off on my daughter. small aside here: I am a massive fruit snack addict nowadays. I keep a nice supply of Welch's fruit snacks in my snack bag because I find them tasty but also the least sticky of all the fruit snack brands. Well, General Mills has two new branded fruit snacks out for the start of school. 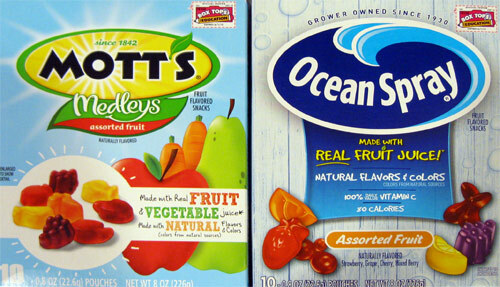 On the left is are Mott's Medleys. These surprisingly aint bad considering they use carrot juice (pear, apple, carrot to be precise). Then we have Ocean Spray branded gummies. Now Ocean Spray is known for cranberries so these mix in cranberry juice (apple, pear, cranberry). They are also pretty tasty. Both varieties are somewhat soft and a bit sticky, but it's nice to have some more varieties and flavors to choose from. They certainly taste better than those super sticky Star Wars fruit snacks I bought awhile back. Ok, let's get back to the pudding. 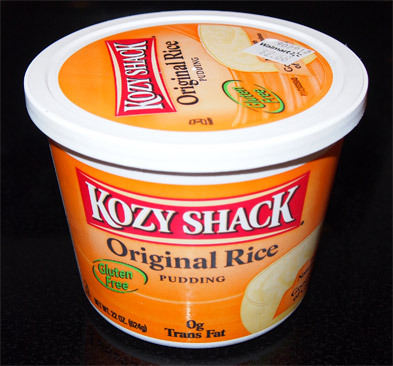 Kozy Shack is also getting into the new fall pudding season. 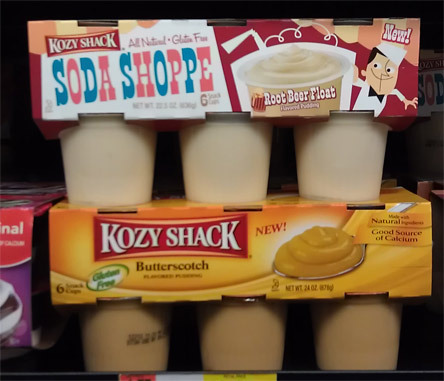 First off is the very happily decorated All Natural Gluten Free Kozy Shack Soda Shoppe Root Beer Float pudding snack cup. I did pick it up and look it over, but I know there is about a 5% chance of me enjoying this snack, so I put it back down. Notice the new Butterscotch pudding carries the more traditional KS packaging. Heck, you can barely see the NEW! on the label. I would have bought these had I not seen the Jell-o cups above (in retrospect, I obviously made the wrong choice). And now time for a short story... nah, this post is long enough. 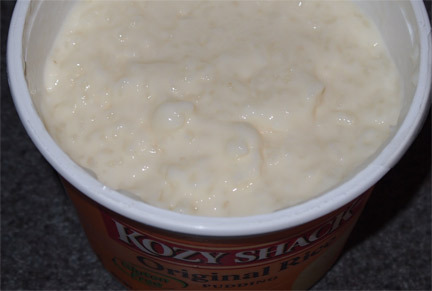 Basically I've been digging into Kozy Shack off and on for almost a decade now. Right now I'm on a rice pudding kick. It's low fat, tasty, and satisfying. I use to prefer the weird little tapioca balls in the tapioca pudding, but in retrospect the rice pudding is where it's at. I'll have between 1 and 2 servings and call it a night. I think the picture above represents the 3rd or 4th container I've bought in the last month or so. Sure I could rock the chocolate pudding or the chocolate rice pudding varieties, but this is usually an end of day snack (8:30-9ish) so I hate to have chocolate before bed. The only downside to getting the big containers instead of the little cups is that as the pudding sits in the fridge, they get progressively more watery. The first day it's real firm, the second is similar, but after that it really starts souping up. By the end of the final serving, we could be doing the final slurping instead of the final scooping. This fact doesn't usually bother me, but I actually wound up tossing the last 1/2 cup of pudding on the last container. Ok, this post was going to end, but then I went to Wegman's. 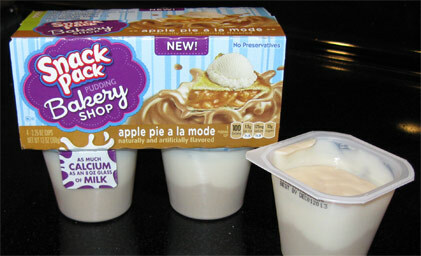 That's right, Snack Pack brand has also got in on the fall pudding action. This really is a back to school epidemic with their new Bakery Shop line. They've got chocolate cupcake, frosted sugar cookie, lemon meringue pie, and apple pie a la mode. I've never been a huge fan of non-refrigerated pudding snacks, but I think we'll make an exception. Hey, if it's terrible, I'm only out a dollar. I'm not 100% sure why, but I picked the apple pie a la mode as the guinea pig. Chocolate seemed to easy, cookie might be too sweet, and I'm not a huge lemon fan, so apple might have some whacky chance of being good (at least after spending a night in the fridge). Well, it's.... something... it definitely has an apple taste... and some cinnamon... and well I don't know if I get a pie vibe, but it's something alright. Let me put it this way, I won't be repurchasing these, but they aren't terrible either. Hey? Are you still there? You just looked at all the pictures didn't ya? Ahhh, that's ok, I kind of expected that. I think everyone gets the idea that there are a ton of new snacks out for the start of school. Enjoy the long weekend everyone and good luck to your kids on their new school year. Pudding, along with ice cream, is my kryptonite. I eat pudding every single day and eat multiple cups of it. I LOVE it, so this post is right up my alley. Great work! 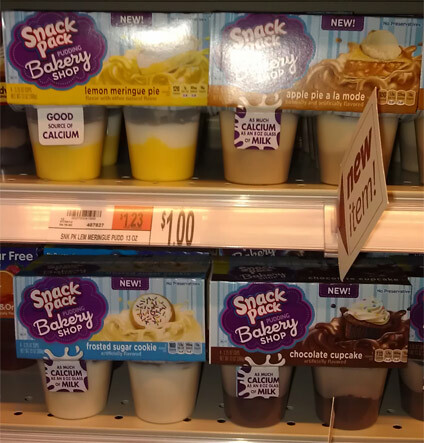 I almost never check out the pudding and yogurt sections in a grocery but for some reason I did 2 days ago, so it's a coincidence that you posted these pictures because they caught my curiosity, too! Jello Pudding also came out with another new flavor that you didn't post that really caught my eye, called birthday cake flavor. It's halfway filled with cake batter pudding topped with a second half of chocolate pudding, so it's supposed to be like a chocolate cake. They also provide jimmies for extra texture. I like their recent attempts at these new flavors but I find it funny because the whole cake batter ice cream fad was so 4-5 years ago. I know this is pudding and not ice cream but they are still late and not doing anything original. hehehe, I have indeed seen all six flavors but forgot to actually photograph all six (there were only 2 at my local walmart, and then 3 or 4 at my work grocery store). I'm afraid of cake flavors too! If not, I would have tried the B&J's cake batter. It mocks me every time I go into Safeway. 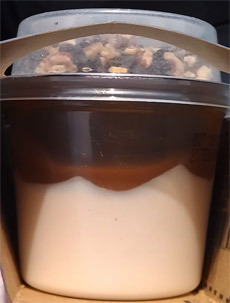 To prevent your rice pudding from getting watery, store the container upside down. It works well for cottage cheese too. Happy Labor Day to both Dubba and Nick! that really works? I will give it a try! Thanks!